Questions 1: How do you use powdered eggs in baking? Powdered eggs do NOT need to be reconstituted in order to be used in baked goods such as cake, cookies, or bread. Add the dry egg powder when you add the dry ingredients and the water when you add the wet. Powdered eggs work great if you are making your own mixes! Here is the chart I use to help me remember how many powdered eggs to use. Questions 2: Do THRIVE powdered eggs taste weird? I have been cooking with THRIVE powdered eggs for over a year now, and I have not noticed any weird flavors. But at our house my husband is the “weirdness detector” here is what he has to say. Note: Last summer another food storage company (who shall remain nameless) had a super sale on powdered eggs. So I bought some. I tried them and they are terrible! I think they taste weird. I don’t like them. Now I won’t buy any powdered eggs but the THRIVE powdered eggs. Just remember that not all food storage is created equal. Question 3: Can powdered eggs be used to make scrambled eggs? 1. Using a whisk, whip air into the powdered whole eggs before scrambling. This makes the texture like fresh eggs. 2. When you reconstitute powdered eggs they are a watery consistency, and these do NOT have the gelatinous texture that fresh eggs have. 3. When you first start scrambling powdered eggs they do not look right. They color is a little to orange and the texture is all wrong. Never fear it will work. As the eggs cook they become the correct color and texture. Place all ingredients into a 4 cup Pyrex glass measuring cup (or similar). Beat mixture for 3 minutes or until completely dissolved and frothy. (I use my immersion blender. And when I say beat I really do mean it. You are NOT mixing to combine. You are beating the eggs until they are all of the way dissolved and there are NO lumps. Then you are beating some more. By beating the egg mixture for a few minutes you are incorporating air into the eggs, this help the texture turn out right). Add 1 Tablespoon cooking oil to a large skillet. Heat oil over medium high heat. Add the egg mixture to the hot oil. Cook eggs using medium low heat, stirring continuously until dry and crumbly. Question 4: Once my can of powdered eggs is opened do I need to refrigerate them? No, powdered eggs are shelf stable until reconstituted. 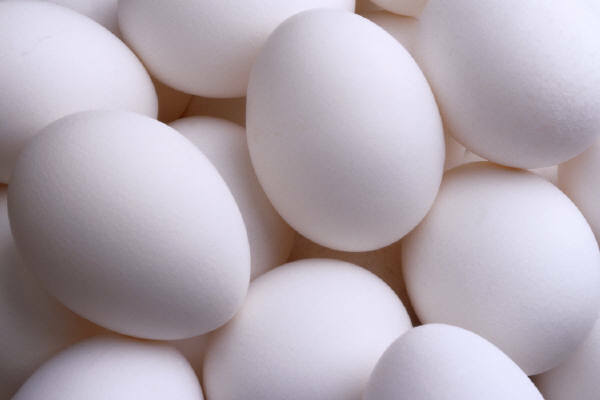 Once you mix them with water you need to treat them the same way you would treat fresh eggs. Questions 5: How many powdered eggs are in one can? Questions 6: Are powdered eggs really less expensive then grocery store eggs? One can of THRIVE powdered eggs costs $20.99 and there are 236 eggs per can. $20.99 / 236 eggs per can = $0.089 / egg. Let’s just round up and say 1 powdered egg cost $0.09. $1.692 per dozen eggs. $1.692/ 12 eggs = $0.141 per egg. Questions 7: If I make cookie dough with powdered eggs can I eat it without fear of getting food poisoning? Yes THRIVE Egg powder is pasteurized, so it is safe to use without cooking or baking. Did I Miss Any? Anything else you want to know about powdered egg? All you have to do is ask.